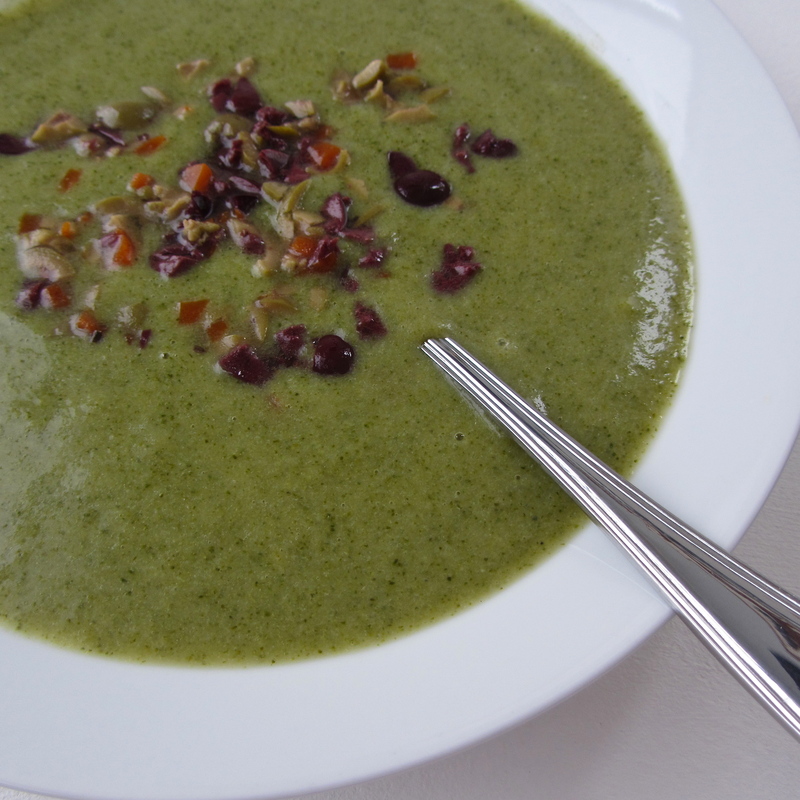 This is pretty much a variation on my Asparagus Soup recipe, which in essence is a variation on my philosophy on how to make a simple and healthy, yet satisfying soup. Once you get the basic formula down, no vegetable will be safe from your soupy hands…HAH! You may wonder why there’s a potato thrown into the mix- it’s completely optional, but it acts as a thickener and (in my opinion) really helps to enhance the overall texture and flavor. Throw in your own homemade Vegetable Stock, and it’ll be even better! 1. Heat 2 tablespoons of olive oil in a medium stockpot, and cook the onions over a medium-low heat until soft and translucent, about 7 minutes. 2. Add in the broccoli and potatoes; sauté for several minutes until the florets turn bright green. 3. Add the bay leaf, then pour in enough vegetable stock to just cover the broccoli. Bring to a boil, then reduce heat and simmer, stirring occasionally, until broccoli is very tender (30-40 minutes). Remove pot from heat, allow to cool slightly. 4. Transfer soup mixture to a blender and puree until smooth, working in batches if necessary. Return soup to pot, season to taste with salt and pepper. Serve topped with chopped olives if desired. * When you go to blend, start at the lowest speed to avoid any possible heat build-up, which could pop the top off the blender. * An immersion stick blender works too, but I think a counter-top blender achieves a smoother texture. Plus, it is much quicker. * You can easily make this soup with any other vegetable, just swap the broccoli out for whatever is in season or available at your local market!